We've had a week of recovery, slow but steady lesson progress, many appointments, and some fun. After Amber and I both came down with a stomach / intestinal virus at the end of last week, it took all weekend and some of this week to recover entirely. Today is our monthly Amber and Mom day, even though Amber had an appointment at the hospital. I lost track of time this month, leaving today as our best option for a non-school day together. We've run errands, had a fun lunch, played with our kitties, played LEGO Dimensions and read a little. In school, we are still devoting ourselves to only a few subjects per day while spending longer lengths of time on each topic. It's still working well and Amber's appointment load hasn't diminished either, so for now we will keep on with this schedule. If you're curious, we documented a day earlier this week as part of a "day in our homeschool" blog round up. 1 block of math - steady but slow progress here. 1 block of Finance Park - and it's finished. Next week is the simulation at Junior Achievement. 1 long block of science - she completed an entire module in Apologia Physical Science, sans test. 1 extra long block poetry - We completed all the lesson work. Now she just has the poetry writing assignments left. 1 block German - she finished her reader and the accompanying exercises. I didn't take a lot of pictures this week. 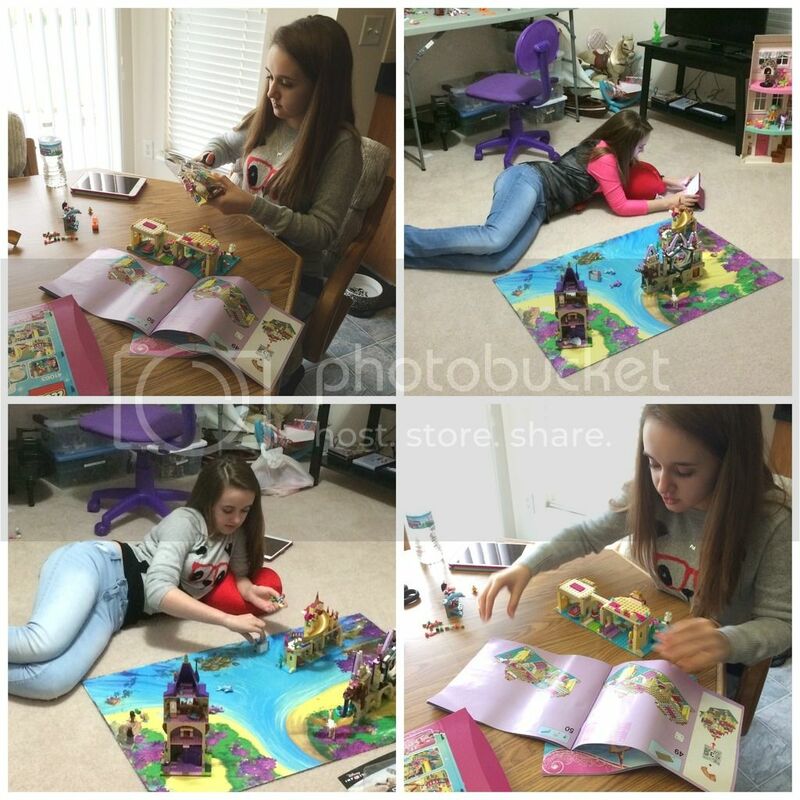 Here's Amber building a new LEGO set and then goofing off with her LEGOS. Monday we picked up Amber's foot orthotics while at the hospital for PT. The orthotics specialist wasn't available and thus did not check the actual fit on Amber that day. Unfortunately, the left one doesn't fit correctly and can't be worn. The right one feels great though! Neither insert is the type discussed which means they fit in precisely one pair of her shoes (well, three now because we bought some new shoes specifically for the orthotics). The orthotics only fit extremely wide toe box shoes. So several items need to be addressed, otherwise she won't be wearing them and we won't be purchasing them. Yesterday we finally got the results of Amber's scope biopsies: as suspected from the doctor's visual scan no problems were found anywhere from the esophagus through the duodenum except the stomach. The damage in the stomach is much milder than expected, thankfully. Amber definitely has gastroparesis though and hopefully by the time this posts she will have started her first dose of treatment medication to encourage stomach contraction. Only time will tell us how this all plays out. The GI doctor can't discern yet if permanent stomach damage is causing the gastroparesis or if it's an intermittent problem caused by the dysautonomia / EDS. Amber may need another gastric emptying test, depending on multiple factors. 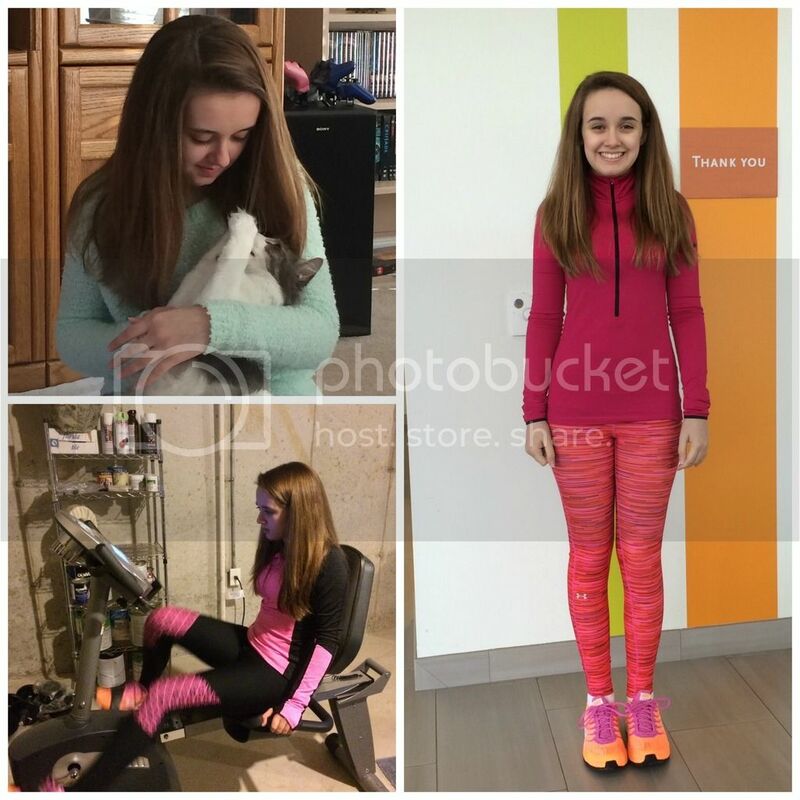 For now we are starting her on the first gastroparesis medication, continuing with the proton-pump inhibitor, then following up in a few weeks to discuss the effectiveness of the treatment and next steps. Cuddling her favorite kitty. Working out at home and one of her two days at Children's this week. Today Amber had an extra PT appointment originally scheduled to meet with her physical therapist and an occupational therapist in order to develop a home yoga program that works for Amber's physical abilities. The idea is to help her body relax and manually move into the rest and digest mode, which her body doesn't know how to do on its own anymore (dang autonomic nervous system). When we arrived, the physical therapist got our approval to contact Amber's pediatrician for a script to prescribe regular OT for sensory processing. The script came through almost immediately (seriously, how did he get the doctor to move that fast?). It is the physical therapist's opinion that Amber needs some sensory processing help at this point. Amber already went through two years of sensory OT, but her body has changed in numerous ways since then. So, today's appointment was double duty yoga training and OT intake evaluation. We'll find out in a week or two what the occupational therapist recommends. This weekend is another cooking lesson for Amber with Grandma plus hopefully some relaxing time at home. We will be taking a couple of days off of school next week, or at least partial days, to spend with my nephews who are staying with Grandma while their parents are out of town. Amber doesn't see her younger cousins as much as she'd like, even though they only live 100 miles away. We're praying the new medication works and Amber feels up to activities with the boys. Praying the medication works. I am so glad the block learning continues to work. I know that is a load off for you. You are doing a great job! It is amazing how much you get through with all the medical appointment and yucky days. I was just thinking how Amber has grown in the time that I have followed your blog. That sent me digging through your past posts to find when I first commented, April 2013. I think I was reading prior to that as some were familiar. Anyways I came across one with steampunk and I just started reading a great steampunk webcomic called Girl Genius. http://www.girlgeniusonline.com/comic.php?date=20021104 It takes some getting into and keeping track of the character but it is great. Your experience with the foot orthotics sounds very frustrating and disappointing. I hope you can get that all straightened out. I'll be praying that Amber's gastro issues are just temporary and that she feels well enough to enjoy time with her cousins. Hope you all have a great week! Yes praying new meds help! Hang in there! Loving her outfit choices!